After such a successful baking experiment last time, this month I really wanted to stretch my filled cupcake boundaries! 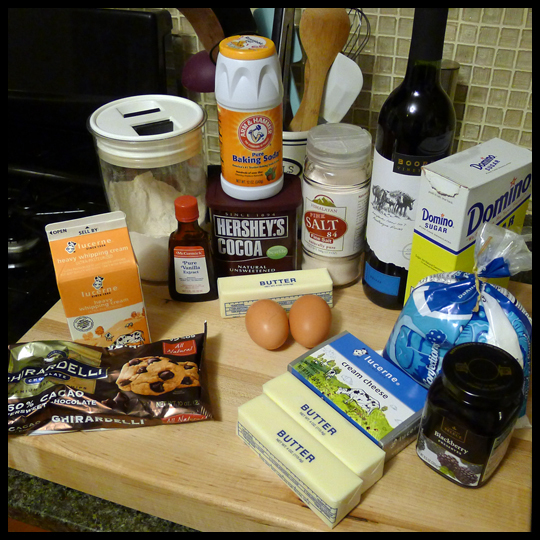 I did some recipe searching for chocolate cake with wine in it – because who doesn’t love wine and chocolate?! 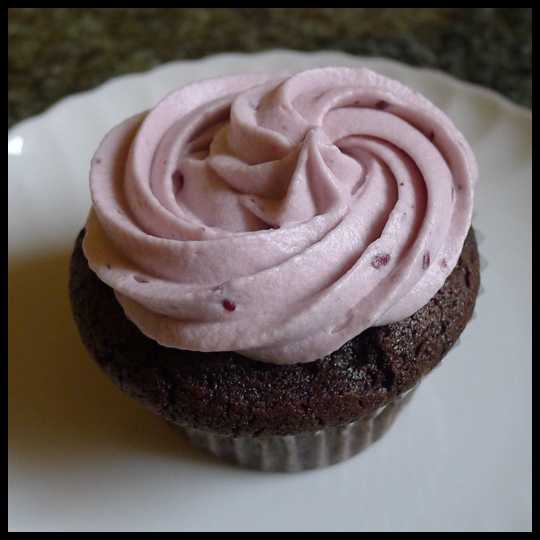 After finding this list of wine inspired cupcake flavors from Enjoy Cupcakes, I decided to try out a Chocolate Blackberry Syrah cupcake. Filled with a chocolate fudge filling, this cupcake sounded rich and decadent – just what I needed to warm me up in the cold month of February. I searched my usual websites for recipes and settled on these cake (www.epicurious.com), filling (www.foodandwine.com), and icing (www.epicurious.com) recipes. Getting all of the ingredients wasn’t a problem this time around! The Safeway in Canton had everything I needed but the wine. For that, I happened to be at Boordy winery a couple of weekends ago with Stacy and her husband for their “Sip & Sliders” event, so after tasting their Syrah (Shiraz) wine I knew I wanted to use it in my recipe! I bought a bottle and took it home . I was ready to bake! 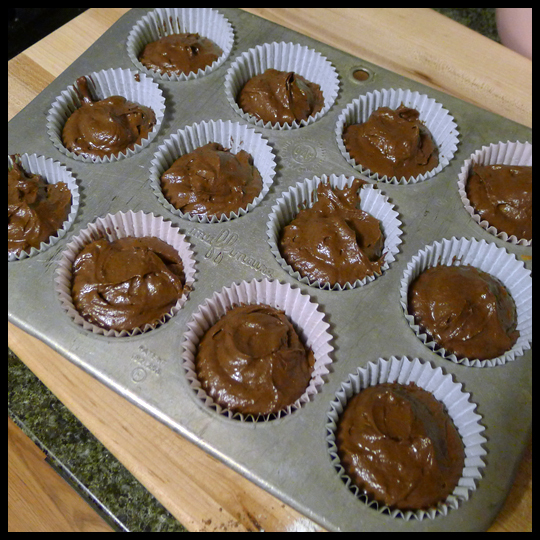 Once the cupcakes were popped into the oven I turned my attention to the chocolate fudge filling. The recipe intrigued and scared me because it seemed too simple. 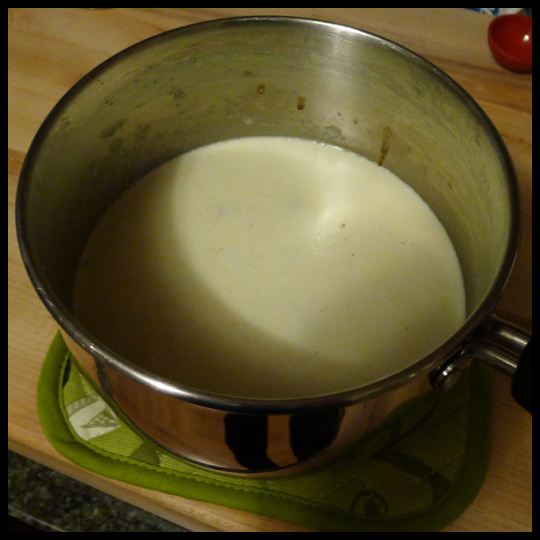 First, bring the heavy whipping cream to a boil – done. 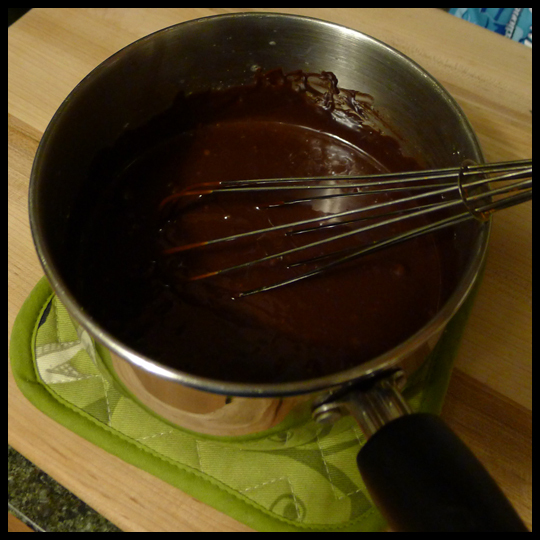 Then take off the stove and pour the chocolate morsels into the pot and walk away for 3 minutes. Wait, leave it for 3 minutes?! I read that part four times before I conceded that I should just stick to the recipe. I set the timer and did some dishes while I was waiting. Ding! After mixing the cream and chocolate, then adding the confectioners’ sugar and whisking it all into submission, I almost whisked my arm off! It was a smooth rich “saucy” consistency that made my mouth water. I set it aside and moved onto the icing. I love blackberries, fruity icing, and buttercream – so this icing is the trifecta for me! I thought that 5 cups of confectioners’ sugar was a bit much, so after adding each cup I tasted the icing and settled on 4 cups of sugar instead. (Check me out, all brave and deviating from recipes when it is only my second attempt!) 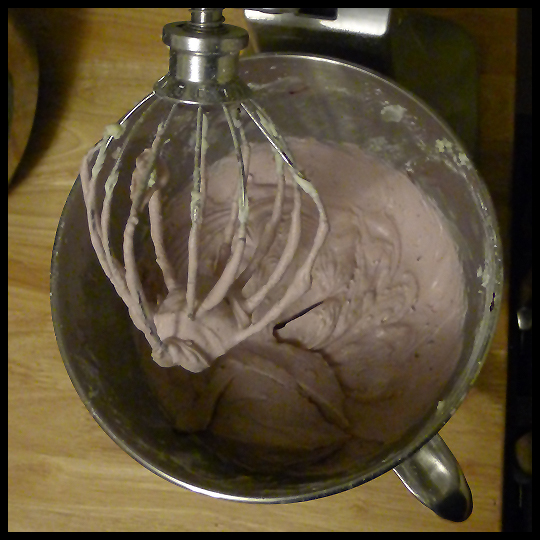 The icing ended up a lovely purple color with flecks of blackberry bits in it – delicious and pretty! 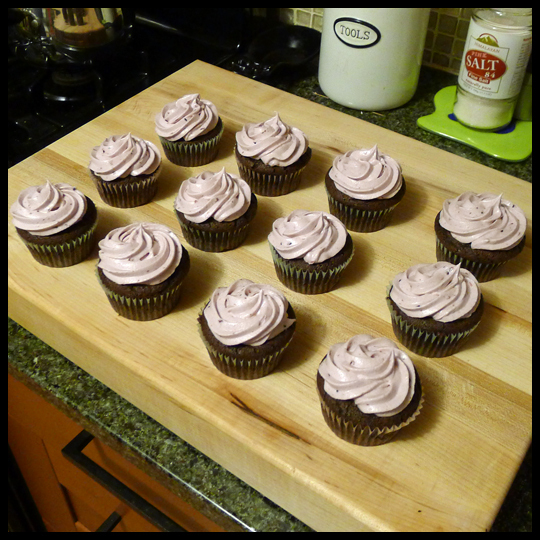 By then, the cupcakes were done cooking – I tested them at exactly 30 minutes, any longer and they might have been too dry… so I advise: test, test, test! 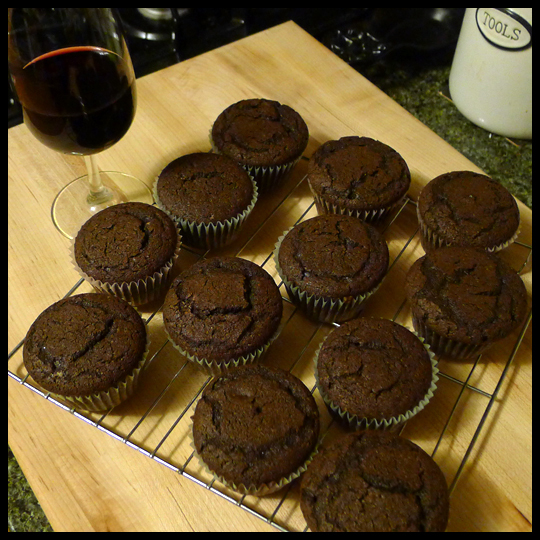 I took them out of the pan and set them to cool on the rack, while partaking in a glass of wine myself. The little cups of cake had a rich chocolate color to them, with rivers of cracks in the top, looking a little like brownies. Now everything was complete and just needed to be assembled. 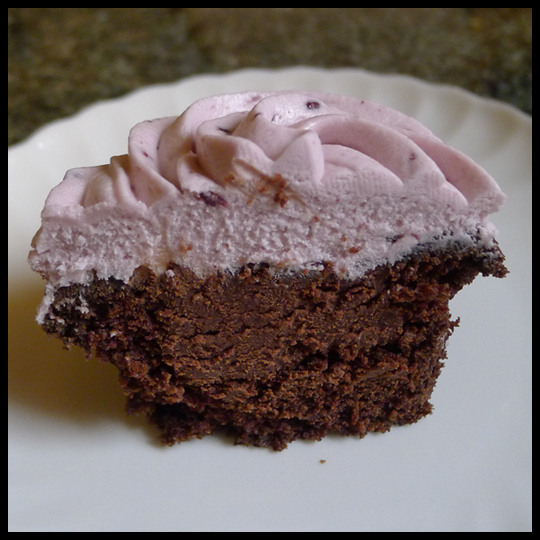 I cut out a “plug” so that I could fill the cupcakes – which was my first taste of the cake, and WOW, I thought it was great! 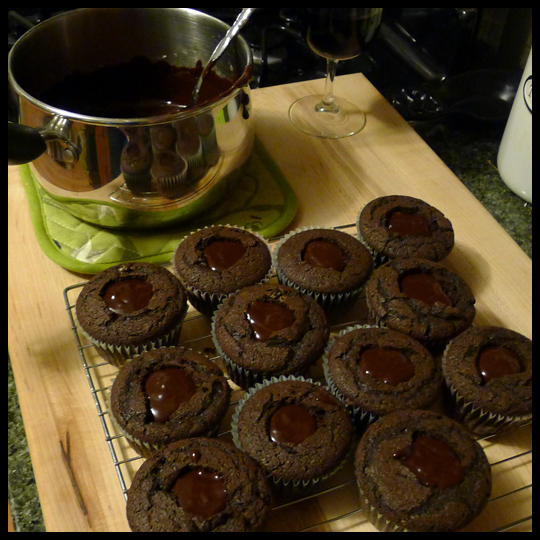 I carefully used a spoon to pour the chocolate fudge into the cupcakes. Then, for the first time, I used a pastry bag and a fancy icing tip to pipe the icing onto the cupcakes. (Thanks to Stacy, who gave me my own little set! Having more of the tools definitely helps make you feel like a pro!) Check out those almost perfect piping skills!! Complete and beautiful, I was done. There was nothing left to do but drink some more wine and try one! I waited until the filling set up and then cut one in half to see what it looked like. Yum! Fudge and chocolate galore! This cupcake may be complicated, and more work than most, but it was well worth it! The cake is savory, decadent, and sweet all at the same time, with flavors that unfold in your mouth. The chocolate filling is thick, but rich and melty once it hits your tongue, it reminds me more of a truffle filling than fudge, but either way, it added just the right amount of creaminess to the cupcake. The icing was just that; the icing on the cake. Creamy and fruity without being overpowering, all while being sweet enough to add a little sugar kick to the otherwise very savory cupcake. I couldn’t be happier with the outcome! Carefully following the recipes, watching the baking time, and tasting everything twice are definitely rules I will continue to follow while I travel down my path of baking enlightenment. And this is a cupcake I will be making again and again! This entry was posted in Baking, Cupcakes, Maryland and tagged baking from scratch, blackberry buttercream icing, chocolate fudge, chocolate wine cake, Cupcake by Crusader Elisa. Bookmark the permalink. It looks SO good! And your new piping skills are impressive! Jenn, I totally agree with you! When I saw the cupcakes last night, I couldn’t believe how great of a job Elisa did piping on her FIRST try! And I can vouch, they are delicious! Sound and look good, but the link for the cake doesn’t take you to a recipe. What gorgeous cupcakes! I’m impressed. Crusader Elisa, these cupcakes were absolutely delish!! I had the pleasure of enjoying them over the weekend, and the first thing I said was that I would have happily offered them at my wedding. I loved all the flavors coming together, but my absolute favorite part was the cake; it was moist and slightly dense, but also light. I find that to be the true test of a quality cupcake; a baker’s ability to create something that isn’t excessively crumbly, or so fluffy and airy that there’s no ‘bite’ to it. The filling was equally delightful and satisfying, and I greedily wiped up the frosting from the container! Overall, I would say early efforts or not, you produced a high quality product, and I look forward to more of your sweet confections. Thank you for the tasty treat!